The user rampages and attacks for two to three turns. However, it then becomes confused. 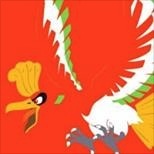 The foe is scared off, to be replaced by another Pokemon in its party. In the wild, the battle ends. This is a good moveset for bagon (Pokemon #371) with the rock-head ability/trait, a Relaxed nature, and equipped with Eviolite submitted by FroakieMan. For use in competitive Pokemon battles featuring an Export option and breeding guide.